Xenophon Moussas is a Professor of Space Physics at the National and Kapodistrian University of Athens. He has a BSc in Physics (1971) and a Ph.D. (1977) from the from National and Kapodistrian University of Athens. He has 40 years of experience in Space Physics working at the University of Athens and at Imperial College of Science, Technology and Medicine (formerly Senior Visiting Research Fellow for many years). He has written more than 110 articles in scientific journals, several in conference proceedings and several book reviews. He is co-author of a book on Space Physics (Greek Open University Publishing House, Patras, 2003), co-author of (a) Astrophysics, (b) Space Physics, (c) Astrophysics Laboratory Exercises, notes for the students. 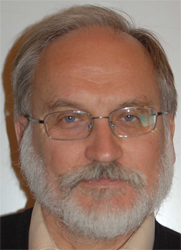 He has supervised 25 PhDs (he presently supervises 4 PhD students), some 250 BSc theses and several MSc dissertations. History of Astronomy: The Antikythera Mechanism, ancient celestial spheres. More than 150 articles in encyclopedias. Distinction: American Geophysical Union: editor’s citation for "excellence in refereeing" in Space Physics, Geophysical Research Letters, 2001. NASA award, 2009,(Group achievement award to Ulysses team for outstanding multidisciplinary team effort which culminated in the highly successful operations and prolific scientific return of the Ulysses mission). Hipparchus award of the Arcadia Cultural Organization. Peer reviewer for European Science Foundation. I had had several exhibitions or contributed to exhibitions: NASA, New York (Children Museum of Manhattan), UNESCO (Paris, inauguration of the International Year of Astronomy, Upsala Gustavianum Museum (the exhibition doubled the number of visitors in the year), The Library of Alexandria, Institute of Astronomy of the Slovac Academy, Crakow University, Olsztyn Planetarium (Copernicus observatory in Poland), Budapest, Cairo, Constantine (7eme salon' astronomie, Algeria), The Venetian Institute of Science, Letters and Arts, Cyprus, and many in Greece (Ionian Center, The University of Athens, University of Patras, many schools).